What's a relatively affordable way to buy a place near Prospect Park? In this week’s Buy Curious, Brooklyn real estate broker Jennifer Rhodes of Ideal Properties Group points out neighborhoods near that Brooklyn gem that won’t break the bank. I’d love to live near Prospect Park, but I'm pretty sure Park Slope is out of my budget. Are there other neighborhood options near the park where I can buy for $500,000 or less? Given that the median price for a one-bedroom condo in Park Slope is $680,000 and $529,000 for a co-op, according to StreetEasy, you’re right that you won’t get much there for half a million. However, there are several alternatives within walking distance of the park where your budget will go a lot further. Prices in Prospect Heights have risen quite a bit in the last year, thanks to a flood of buyers discovering this pretty, leafy treasure of a neighborhood just north and east of Grand Army Plaza. The neighborhood is still slightly less expensive than Park Slope, and it is possible to find a one-bedroom in Prospect Heights for under $500,000—but not a two-bedroom. The median price for a one-bedroom condo is $822,000, while a one-bedroom co-op goes for $412,000; a two-bedroom condo goes for $835,000 and a two-bedroom co-op costs $897,000. Not many apartments are available though. A stone’s throw to Prospect Park, the Brooklyn Museum and the Brooklyn Botanic Garden, Prospect Heights—which has long been home to a large population of Caribbean immigrants—has brownstones as well as newer luxury condo buildings, offering a meeting point of old and modern Brooklyn. 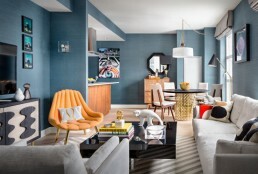 Recently, many young professionals and families have also started moving here. Vanderbilt and Washington Avenues bustle with great shopping, dining and nightlife, including 606 R&D, a restaurant with a rotisserie and a doughnut-making robot; mayonnaise store Empire Mayonnaise; and Unnameable Books, a bookstore that sells an eclectic mix of new and used tomes. The area is serviced by the 2, 3, 4, 5, B and Q subway lines. A little south and east of Prospect Heights lies Crown Heights, a neighborhood where prices are also climbing. But deals still exist. In fact, the median price for a condo is $450,000 and for a one-bedroom co-op $297,000, while a two-bedroom condo costs $634,000 and a co-op goes for $475,000. A sprawling neighborhood that's broken up into different areas, Crown Heights does have a portion just to the east of Prospect Park, south of Eastern Parkway and near the entrance to the Brooklyn Botanic Gardens. The area—which features a slew of brownstone and limestone townhouses—boasts a large Caribbean population, as well as a smaller Hasidic Jewish population, and young professionals and artists have slowly been moving to the neighborhood in recent years. It is serviced by the 2, 3, 4 and 5 trains. As more affluent people move to the neighborhood, different dining options have opened up. Eateries include Catfish Bar & Restaurant, which serves authentic Cajun fare; Bar Corvo, which focuses on Northern Italian cuisine; and Barboncino, which specializes in Neapolitan pizzas. Head south and east of the park to find more space and better value. Inventory is tight here too, and people—especially young families from Manhattan and other parts of Brooklyn, including Park Slope, Carroll Gardens and Cobble Hill—are trickling in. While crime rates used to be high here, the area has improved. Prospect Lefferts Gardens is bound by Empire Boulevard to the north, Clarkson Avenue to the south, New York Avenue to the east, and Ocean Avenue and the park to the west. 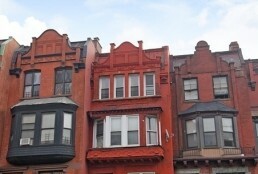 Maple Street, Sterling Street, and Lincoln Road are lined with brownstones and limestones. The neighborhood also boasts a slew of single-family Tudors and shingled Victorians. The Q and the B trains at Prospect Park, as well as the 2 and 5 at Sterling serve the neighborhood. Prospect Lefferts Gardens hasn’t yet seen the influx of cute bars, cafés and shops that are all over Crown Heights. Wholesome Gourmet Market, a new organic supermarket, recently opened on Flatbush Avenue between Lincoln Road and Lefferts Avenue. The neighborhood has a large West Indian population, and West Indian food is hugely popular in the area. Culpepper’s on Nostrand Avenue is considered the best. At last check, only eight listings were available under $500,000, but the median price for a one-bedroom condo was $282,500 and $309,000 for a co-op, according to StreetEasy. Only one two-bedroom is available—a co-op priced at $350,000. Lucky buyers may even be able to find a townhouse for under $500,000 among the rare foreclosure listings. Shhh! Residents of Windsor Terrace like to keep this neighborhood to themselves. Located on the southwest corner of Prospect Park, there are several one-bedrooms under the $500,000 mark, as the median price for a one-bedroom here is $375,000, in pre-war co-op buildings that offer spacious layouts. There are only three two-bedrooms on the market at the moment: a condo for $875,000, and both a condo and a co-op listed for $550,000. The residential area boasts limestone and brick row houses. There are mostly townhouses with a few co-op buildings near the park. The neighborhood has become increasingly diverse in recent years, and is now home to Irish, German-American and Italian-American families, in addition to Greek and Hispanic residents, and a smattering of Syrians and Jewish Americans. The F train will get you to Midtown in about 35 minutes. Since there isn’t much in the way of conveniences in the area, most Windsor Terrace residents travel to the big stores like Fairway in Red Hook and Whole Foods in Gowanus. For last-minute shopping, they shop at small local grocers. Just south of Windsor Terrace and not far from the southernmost tip of Prospect Park is Kensington. The median price for a one-bedroom co-op here is $259,000; no one-bedroom condos are for sale. The median for a two-bedroom co-op is $395,000, and there’s only one two-bedroom condo listed for $649,000. That said, there's a reason the area is so cheap. If you're looking for the kind of bar and restaurant scene--not to mention the chock-a-block retail and entertainment options--available along Park Slope's Fifth and Seventh Avenues, you'll be disappointed. On the other hand, you'll find a melting pot of different immigrant communities, including Pakistanis, Bangladeshis, Russians and Caribbeans, as well as Hasidic Jews. Housing stock consists of two-family and three-family homes, small apartment buildings and high-rise buildings, and the area is serviced by the F and G trains. 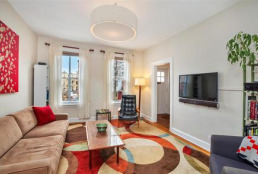 Want to live in Prospect Heights? Prospect Heights one-bedroom/one-bathroom co-op, $320,000: This charming pre-war co-op at 21 Butler Place between Sterling Place and Plaza Street East features stained glass and hardwood floors, as well as access to a rooftop deck. The pet-friendly building has a live-in super and offers bike storage. Crown Heights one-bedroom/one-bathroom condo, $450,000: Located at 524 Saint Johns Place at Classon Avenue, this one-bedroom is at the higher end of your budget. The unit features hardwood floors, exposed brick walls, oversized windows and high ceilings, as well as in-unit laundry and central a/c. There’s also a gym, an elevator, and 18 years left on a 25-year tax abatement. Crown Heights one-bedroom/one-bathroom co-op, $299,000: Located at 35 Crown Street between Washington and Franklin Avenues, this HDFC co-op is just around the corner from the Brooklyn Museum. 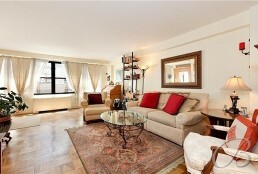 The one-bedroom has original hardwood floors in the living room, oak floors in the bedroom and three large closets. The building—which has a live-in super—has strict income restrictions. An individual can’t earn more than $91,000 a year, and a couple can’t earn more than $104,000. Prospect Lefferts Gardens studio/one-bathroom co-op, $189,000: This studio at 50 Lefferts Avenue between Washington and Bedford Avenues features a renovated double galley kitchen, a foyer with a built-in banquette with dining table, a sunken main room, three closets and hardwood floors with inlays. The pet-friendly co-op building has a part-time doorman, a bike room and a laundry room. Windsor Terrace one-bedroom/one-bathroom co-op, $375,000: Located in an Art Deco elevator building at 40 Ocean Parkway at East 7th Street, this one-bedroom features an oversized bedroom and living area, a dining foyer and a renovated, windowed kitchen with pre-war curves and arches. Kensington two-bedroom/two-bathroom co-op, $449,000: This 1,100-square-foot corner unit at 415 Beverly Road between East 4th and East 5th Streets has hardwood floors, lots of closets, renovated bathrooms and a large master bedroom with a walk-in closet. Building amenities include a 24-hour doorman, a live-in super, a bike room, a storage room and parking.